1901. 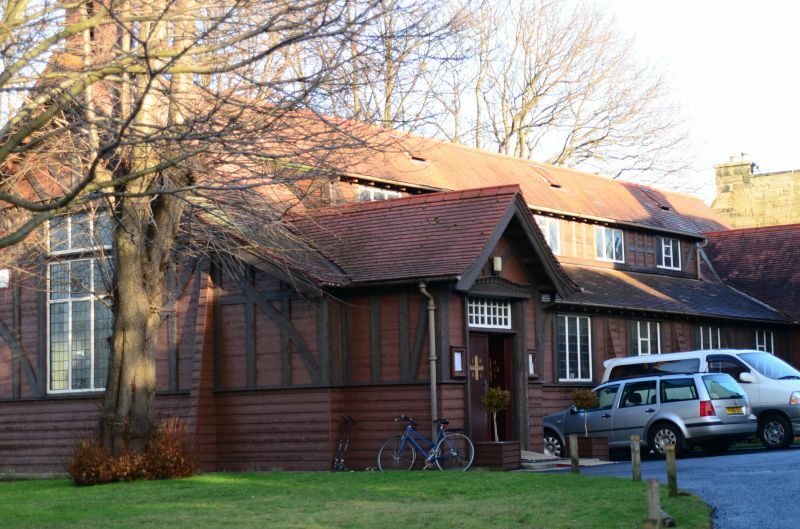 7-bay rectangular plan, Arts and Crafts timber framed church. Half timbering and horizontal boarding; corniced cill course; overhanging eaves; plain bargeboards; red plain clay roof and ridge tiles; pivot ventilators. Prominent gabled porches to S; timber clad buttresses; long swept roof box dormers to clerestorey; timber belcote to W.
S (PRINCIPAL) ELEVATION: 7 bays, arranged 1-5-1. Large square tripartite timber leaded windows to central 5 bays; timber clad splayed buttresses flanking central bay. 5-bay box dormer centred above. Catslide ventilators at ridge. Gabled entrance porches to outer bays. Small porch to left with double leaf timber door to centre, 24-pane fanlight above. Larger porch to right leading to vestry; timber door to centre, 15-pane fanlight; flanked by small windows. E ELEVATION: central gable with low pitched side aisles. Porch to left, flat roofed rendered boiler hut with chimney to re-entrant angle, right. N ELEVATION: 7 bays. Tripartite windows to each bay; timber clad buttresses flanking central and penultimate bays. 5-bay box dormer centred above. Boiler hut to far left. W ELEVATION: central gable with low pitched aisles, tripartite transomed leaded window to centre, later 20th century stained glass panel to centre frame; overhanging timber dentil cornice below gable apex, timber clad buttresses flanking centre bay. Small weatherboarded timber belcote, exposed bell in recess, decorative ridge tile, terracotta cross. Coloured square paned glass in leaded windows at ground floor, diamond panes to dormer windows (pivot vents to alternate window formations). Plain red roof tiles, terracotta ridges. INTERIOR: open queenpost timber roof structure supported by 6 square-plan stop chamfered timber columns, square dentilled capitals. Timber boarding throughout. Circa 1950 pews to W end of nave. Central panel of stained glass in W window dated 1960 by Felix McCulloch. 17th century German polychromed statue of The Madonna and Child to left of W window. Original carved oak altarpiece and war memorial sited near the main entrance following earlier remodelling. Arts and Crafts wrought iron light fittings in nave, corresponding wall lights to aisles. BOUNDARY WALLS: tall random rubble stone wall capped with half round copes. Retaining wall to N.
This is a good example of a circa 1900 timber church which boasts a striking interior. It was built as a temporary structure whilst funds were raised for a more permanent building; it is a rare example as temporary churches were most commonly clad in corrugated iron and built from available catalogue designs. St Andrew's is a rare, virtually unaltered, example of timber church architecture in Scotland which has maintained its material quality for a century, with lead glazing, plain tiles and belcote externally, columns roof structure and light fixtures internally. Despite the church being originally constructed as a temporary building there is much attention to detail to the exterior and interior of the building with decorative features typical of the Arts and Crafts period. The church was built within six months, at a cost of £850, and was consecrated on the 27th April 1902. The building has remained in permanent use since then, ensuring its survival. The Catholic Diocese purchased the mansion Edgehill House and its garden ground in order to build a church in the west end of Edinburgh. Previously the congregation travelled large distances to worship either at St. Mary's Cathedral or St. Cuthbert's, Slateford. List description revised as part of resurvey (2009).